I’m not normally what you’d call a cupcake person. 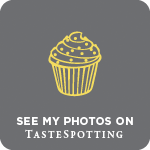 Rugged muffins, buttery financiers and slabs of brownie I can get behind, but American-style cupcakes weighed down with buttercream and covered in sprinkles? Not so much. 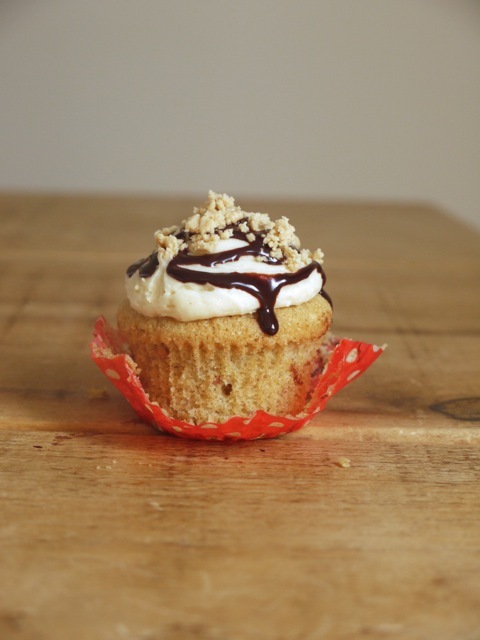 Yet try as I may, there’s something so birthday-appropriate about a cupcake and with two to celebrate this weekend just gone, I’m going against my better nature and sharing these peanut butter beauties. My scrooge-like objection to sprinkles is usually that they bring nothing to the table except added artificial colouring. But these sprinkles, courtesy of cupcake queen Jemma, are homemade and full of flavour. Peanut butter and icing sugar are blitzed together until they form crumbly little nuggets of melt-in-the-mouth deliciousness. 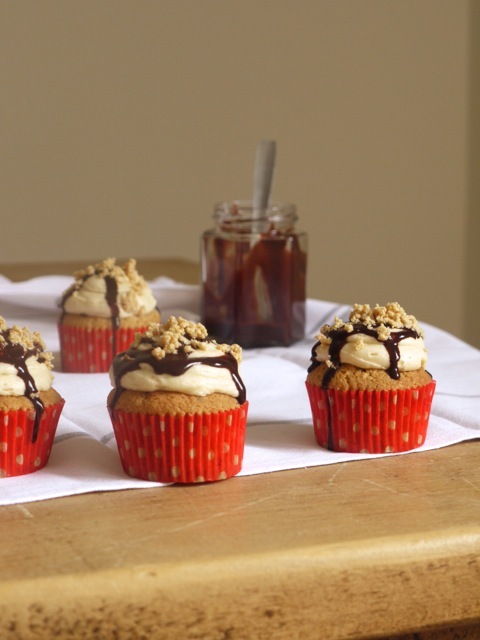 Jemma’s original recipe is for PB&J cupcakes with a pocket of jam inside each cupcake as well as a dollop on top. It’s a combination I adore, but one of my friends doesn’t eat fruit of any kind (I know, it’s bizarre, we discuss it all the time), so I subbed in chocolate sauce instead. If you’re feeling fruity, the option is there, seedless strawberry, raspberry or a spoonful of blueberry would all be wonderful. For someone who brings cake to any and every occasion, my transport methods are still distinctly amateur. I packaged these cupcakes up in individual boxes and while two survived perfectly intact, the third arrived looking like cupcake roadkill, icing and sprinkles smooshed against the tissue paper inside. Perhaps it was a subconscious way of rebelling against traditional cupcake perfection. Perhaps I’m just horribly clumsy. But at least I know it still tasted delicious. 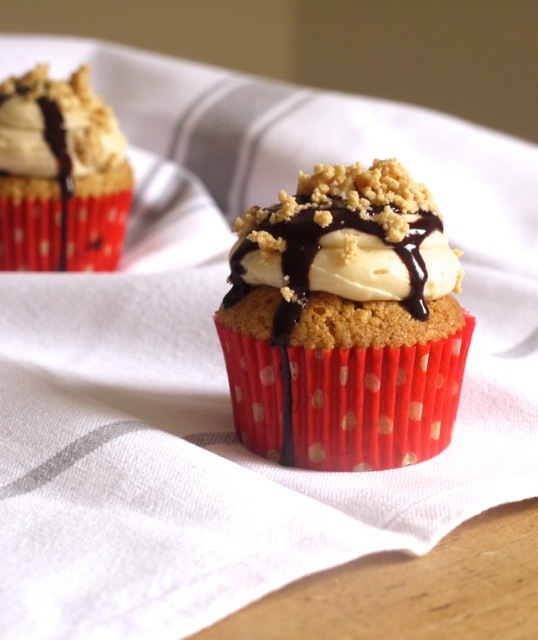 Tender peanut butter cupcakes with fluffy peanut buttercream, chocolate sauce and peanut butter crumbs. Very barely adapted from Cupcake Jemma's recipe for PB&J cupcakes (check out her YouTube channel, it's filled with all sorts of sugary buttery video deliciousness). If you're making your own chocolate sauce, you want it on the thick side so it doesn't run completely off each cake. Preheat the oven to 170 degrees C fan assisted and line a 12 hole cupcake tin with paper cases. Sift together the flour, sugar, bicarbonate of soda and salt then add the butter, eggs and peanut butter and beat with an electric whisk for 60 seconds, until smooth. Add the milk and vanilla extract and whisk a further 20 seconds or so until combined. Divide the mixture between your paper cases and bake for 20 minutes, or until they spring back when touched. Allow to cool completely. To make the buttercream, beat together the butter and peanut butter until pale and fluffy, about 5 minutes. Sift over half the icing sugar and beat carefully to combine. Sift over the remaining icing sugar then add the milk and beat again until really smooth and light, another 3 - 5 minutes. To make the peanut butter crumb, blitz the peanut butter and icing sugar in a food processor for 1 - 2 minutes until little crumb-like morsels form. To assemble, poke a hole in the middle of each cupcake with a skewer, twist to widen slightly then fill with a trickle of chocolate sauce. 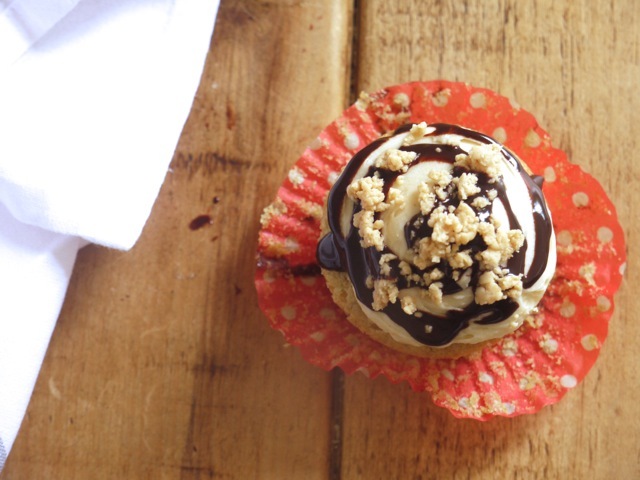 Pipe on the buttercream, drizzle with more chocolate sauce then sprinkle with peanut butter crumbs. 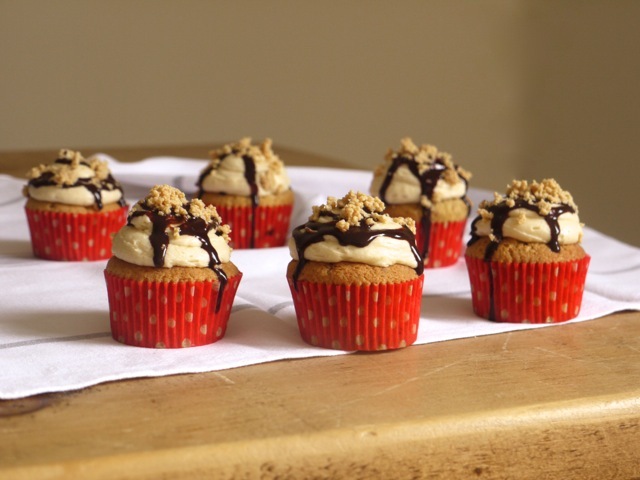 Best eaten on the day of making, these cupcakes will keep in an airtight container for 2 days. If you live somewhere very hot, you might want to pop them in the fridge. 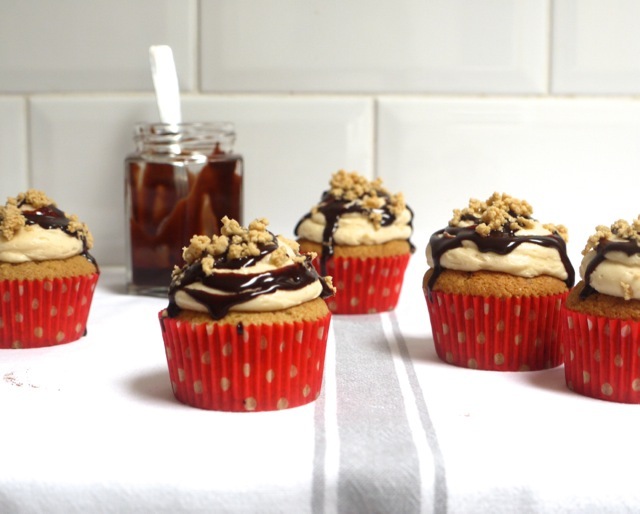 I’m more a fan of pb + chocolate than I am of pb+j so these cupcakes are right up my street. I’m pretty sure I’d end up eating these peanut butter crumbs by the spoonful – they sound so good! I don’t make many cupcakes either, but they always make me happy!! And even though I don’t make many, I always WANT to! These look fabulous! Peanut butter and chocolate is such a perfect combo. These look lovely and much less sickly sweet than most cupcakes so that gets my vote. Peanut butter crumb? What the what?! SO much better than sugary, flavorless sprinkles! Oh wow, so much peanut butter goodness. I’m obsessed with the stuff right now so these are beyond awesome. I’m not a huge cupcake fan either. All that buttercream leaves me feeling ill…but I do love making them though. These look fantastic, and I love the crumb topping.